Long credits a wrong turn upon his arrival at Table Rock Lake as the key to his decision to fish the “Long Creek” arm of the Ozarks reservoir. He noticed the water in that area was reddish-brown. Long said, “When I went over that arm of the lake, I saw that it was murky, and I said to myself, ‘this is where I’m going to spend all four days in the tournament’.” Throughout the tournament he stayed in the general area observed from his vehicle, flipping wood cover with a black and blue jig and a “Flipping Bug” made by another of his sponsors, Charlie’s Worms. The win gives Long his second FLW Tour championship trophy, winning his first in June 2010 at Lake Guntersville in Alabama. Said Long, “When you win one, they can say you just got lucky, you are a one-hit wonder. 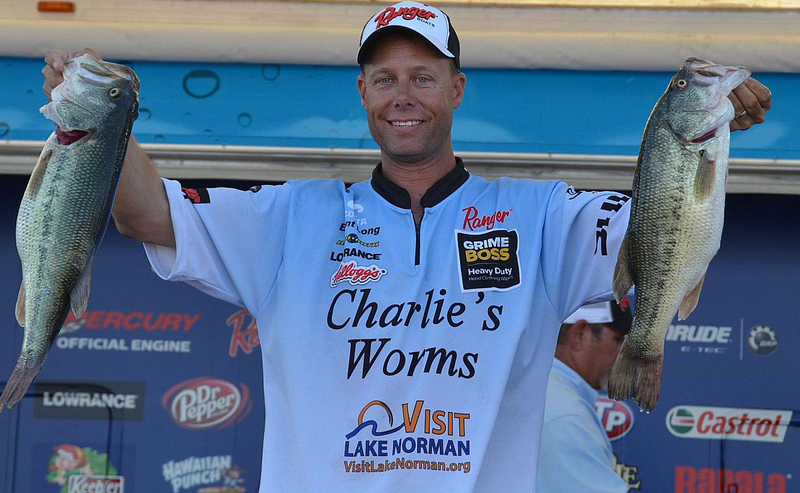 When you win two, I think that solidifies you as a good angler.” Long, a lifelong resident of the Lake Norman area and a local General Contractor was born in Lincolnton and then moved over to Cornelius in 2007. He learned fishing with his father at a young age, entered his first tournament at 17 and began fishing on the pro circuit in 1997. For more information, please contact Travis Dancy, Sports Sales Manager for Visit Lake Norman, at 704-987-3300 or tdancy@lakenorman.org.